Besides helping with banners, POP, and other forms of promotion, anyone can call Samlex tech support with a toll-free number. Troubleshooting, in- stallation advice, you name it. There's no voicemail; someone always picks up. "Tech support is not a department," Hamanishi says, "it's our company culture." 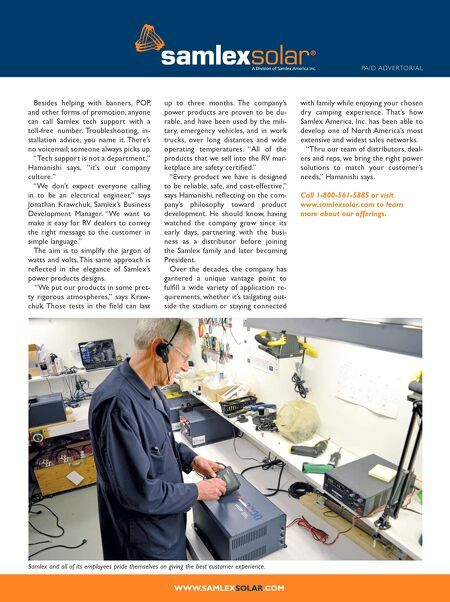 "We don't expect everyone calling in to be an electrical engineer," says Jonathan Krawchuk, Samlex's Business Development Manager. 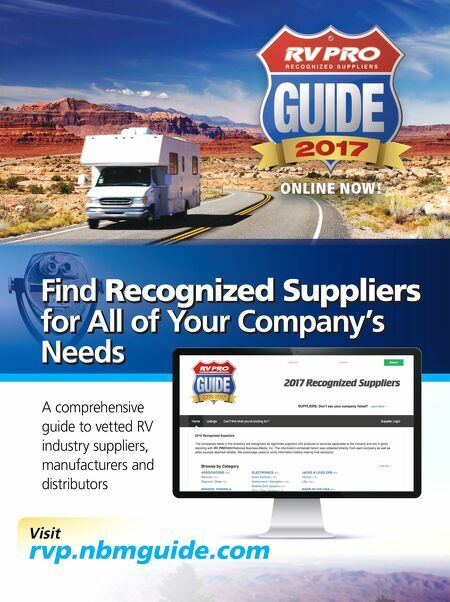 "We want to make it easy for RV dealers to convey the right message to the customer in simple language." The aim is to simplify the jargon of watts and volts. This same approach is reflected in the elegance of Samlex's power products designs. "We put our products in some pret- ty rigorous atmospheres," says Kraw- chuk. Those tests in the field can last up to three months. The company's power products are proven to be du- rable, and have been used by the mili- tary, emergency vehicles, and in work trucks, over long distances and wide operating temperatures. "All of the products that we sell into the RV mar- ketplace are safety certified." "Every product we have is designed to be reliable, safe, and cost-effective," says Hamanishi, reflecting on the com- pany's philosophy toward product development. He should know, having watched the company grow since its early days, partnering with the busi- ness as a distributor before joining the Samlex family and later becoming President. Over the decades, the company has garnered a unique vantage point to fulfill a wide variety of application re- quirements, whether it's tailgating out- side the stadium or staying connected with family while enjoying your chosen dry camping experience. That's how Samlex America, Inc. has been able to develop one of North America's most extensive and widest sales networks. "Thru our team of distributors, deal- ers and reps, we bring the right power solutions to match your customer's needs," Hamanishi says. Call 1-800-561-5885 or visit www.samlexsolar.com to learn more about our offerings. PA I D A DV E RTO R I A L WWW.SAMLEXSOLAR.COM Samlex and all of its employees pride themselves on giving the best customer experience.